Cliftonville has confirmed that striker Jay Donnelly will once again be left out of his squad for this Saturday’s game after admitting distributing an indecent image of a child. Donnelly, of Ardilea Drive in the Ardoyne area of Belfast, pleaded guilty to the offence a fortnight ago and will now be sentenced in January. The 23-year-old had continued to play for the team since he was charged in court on 17 May, but was suspended last week after feminist groups threatened to protest at the club’s match against Dungannon Swifts. “The club has made a statement on the matter and as far as I’m aware nothing has changed from that,” manager Barry Gray told the BBC. Asked if Donnelly will play against Glenavon tomorrow, he was quoted as replying “no”. “It’s a matter for our board to discuss and, from my perspective, we just concentrate on our week-to-week duties,” Gray added. Donnelly’s supporters on social media have been keen to play down the significance of the conviction, many accusing critics of having a sectarian motive in calling for his suspension. His supporters have also engaged in intense speculation on social media about the age of the child whose image he shared, although such details have not emerged into the public domain. But the Belfast Feminist Network and Reclaim the Night said Donnelly’s behaviour was “reprehensible” and that they had been “completely disgusted” by Cliftonville in continuing to play him after he was charged in May, only suspending him after they threatened to protest. 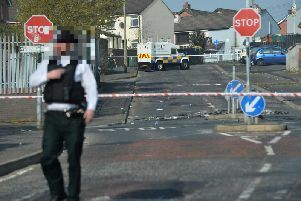 Cliftonville has said saying it was “acutely aware that a young woman has suffered because of Jay Donnelly’s actions” adding that it feels it has a “duty of care to everyone associated at this moment in time”. The News Letter has been in touch with club sponsors Fonacab and Sean Graham Bookmakers about the issue, but neither made any comment. Belfast Feminist Network said it is meeting the IFA next week to “talk about issues that transcend one club and are endemic to sport generally and football specifically”.